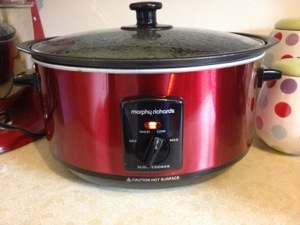 I have finally achieved one of my goals in life: I have a slow cooker. I know. I know. It doesn’t sound like much, but it is a really huge development for me as a person. There are some things you just can’t make without a slow cooker. You can live without those things, but your life would be devoid of joy. You may think you are happy now, but there is happiness you can’t even imagine on the other side. CB asked me last night if our slow cooker has been off since we got it, and I was able to answer ‘yes’ only because I haven’t done any overnight experiments yet. I’m convinced that my slow cooker can time travel (it is parked next to the TARDIS) or, at least, look into the future. When I first set it on the counter on Monday, I stared for a moment, contemplating what I should first make. It reached out to me, explaining that chicken noodle soup was truly the only option. 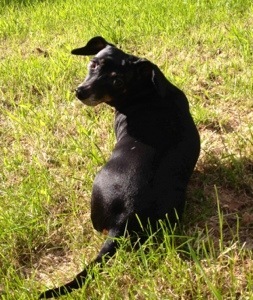 I even had leftover roasted chicken from Sunday’s dinner! How did it know that, the very next day, I would feel bad and need something comforting and wholesome to eat? It’s magic! One of the most appealing things about a slow cooker (and the real selling point for CB) is that I can make dinner at any time during the day. I sat down to write this post at 10:30am, and tonight’s dinner is already done. It is, honestly, a matter of practicality. In my ever-growing quest to understand my body, I had to realise that I don’t always have the energy to make dinner at dinner time. When it gets to be about 5pm and I’m not sure I can roll myself off the couch to cook, it makes the option for unhealthy take-away that much more enticing. If I’m brimming with energy at about noon, why not make dinner at noon? 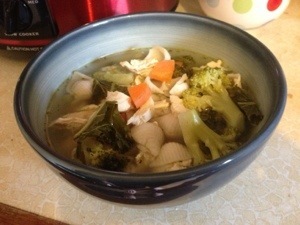 A slow cooker gives me the flexibility to create a healthy meal without undue strain on my body. I also already have three slow cooker meals in the freezer, ready to be thawed whenever we want them. I made almost an entire week’s worth of dinners in one day. One busy afternoon — without too much pressure because they didn’t have to be on the table at any particular time — and I had one dinner for that night, one for the fridge, and three to be frozen. I was inordinately proud of myself and intend to integrate it into a weekly ordeal. 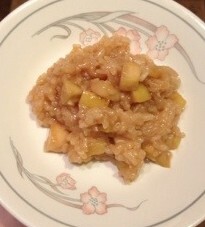 Last night, I also made this apple pie risotto from our gfree life. I added two tablespoons of flax meal to the recipe (I just can’t help myself). It was amazing — sweet without being too sugary, dessert-y without being heavy, and filling enough that CB had some for breakfast instead of his usual porridge. CB kept calling it “crumble” because that’s what it smells like. *You can use bone-in chicken if you take the weight into consideration and understand that you may get loose bones in your soup. It does add a certain richness in flavour, but I don’t like taking the chance. Dump all ingredients EXCEPT noodles/pasta into the slow cooker. Stir together and cook on low for 6 hours. A. If using precooked chicken, stir in your noodles/pasta and cook on high for 30 minutes. Remove bay leaf and serve. B. If using uncooked chicken, remove it from the slow cooker at this time. Place it on the cutting board and carefully use the forks to shred the meat. Return to slow cooker with noodles/pasta and cook on high for 30 minutes. Remove bay leaf and serve. I was so excited for this soup.